Live visual mix for a night of live electronic music from Melbourne based artists Alphaloopy, Lucky Quinn and Zen Robotic, at Loop Project Space and Bar. Live visuals for Laser Highway, Australia’s only night dedicated to the very best anything-with-the-word-wave-in-it, italo-disco, outrun, electro, 80’s jams, games, and anything else firmly with its roots in 80’s synthesizer-based music. 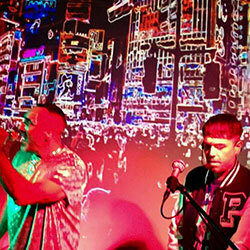 Music performances from Togetherapart, Tessel (NSW), Arson Fire & Zerotonine at Loop Bar and Projection Space.